The 2018 Asia's 50 Best Restaurants list revealed some unique surprises about the region's best dining destinations. 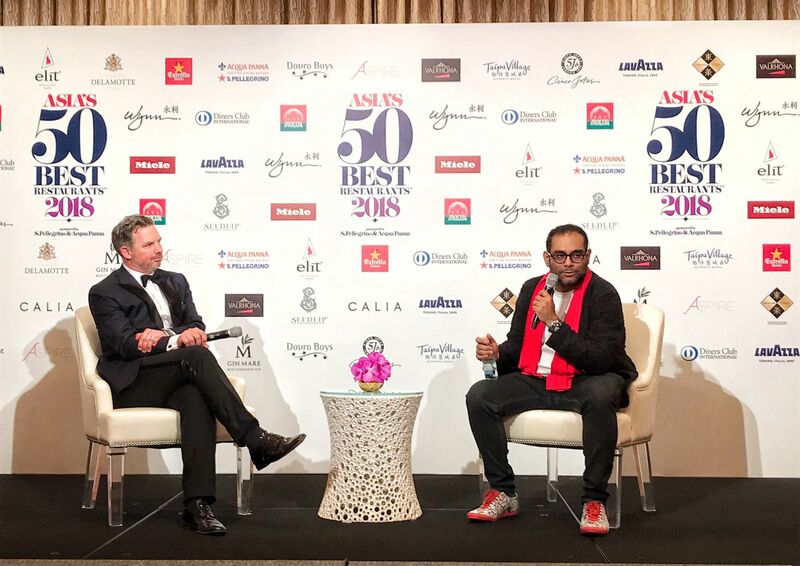 No one could have a predicted a more remarkable outcome, not even the man of the hour Gaggan Anand; his eponymous restaurant made history by topping the sixth edition of the annual Asia’s 50 Best Restaurants, sponsored by S.Pellegrino and Acqua Panna, list for a record fourth time. Held for the first time in Macau at the impressive Wynn Palace, the awards was also “the least stressful” for Annand. “I feel like Bjorn Borg winning Wimbledon for four years straight, and I hope I didn’t burn out,” he quipped at a short press conference following the announcement. “It’s like you get what you want, and you don’t expect it again and again, and again. He did, however, affirm that his success reflects the importance of innovation. “It’s not about a recipe or a dish but how you innovate in that 150sqm (space) that you have, and how it impacts every diner that comes there. Following closely are equally creative restaurants with a bold approach to creating a memorable dining experience. At No. 2 is Zaiyu Hasegawa’s Den, Japan’s best restaurant, while the third spot went to another Japanese innovator, Florilege in Tokyo, Japan, led by chef Hiroyasu Kawate’s imaginative modern French cooking. The highest placing for a Singapore restaurant is Odette, which climbed four spots to secure their position at No. 5 on the list. Of course, many were excited to see native chefs make their mark, such as Thailand’s Bongkoch ‘Bee’ Satongun of Paste restaurant in Bangkok, which debuts at No. 31. She was this year’s Best Female Chef award recipient, and is noted for her focus on reviving age-old recipes and putting a progressive and personal spin on them. The win reminded some of the previous recipient and Bangkok’s other native innovator Duangporn ‘Bo’ Songvisava of Bo.Lan who was honoured in 2013. Her restaurant, however, dropped 18 places to No. 37. Though no restaurant from the Philippines made the list this year, chef-owner Jordy Navarra’s Toyo Eatery in Manila was honoured with this year’s Miele One To Watch award. “With a menu celebrating local culture and traditional dishes, Navarra is a young talent who is advancing the cuisine with creative flair and a progressive approach, but also with precision and attention to detail,” shares William Drew, Group Editor of Asia’s 50 Best Restaurants. For more details about Asia' 50 Best Restaurants 2018, visit the official website. Digest The World's Largest Underwater Restaurant Is Now Open, But Can You Get A Reservation?